Use Fiddler to diagnose the WCF service call traffic! Fiddler won’t monitor localhost by default so see the information here http://www.fiddlertool.com/Fiddler/Help/hookup.asp#Q-LocalTraffic to get this working. I replaced localhost with ipv4.fiddler in the url and then the logging just worked. The naming convention used is the namespace + classname of your domain service with the dots replaced with dashes. When creating RIA Services class libraries I was caught out once or twice by forgetting to add the libraries as references to the web host application. 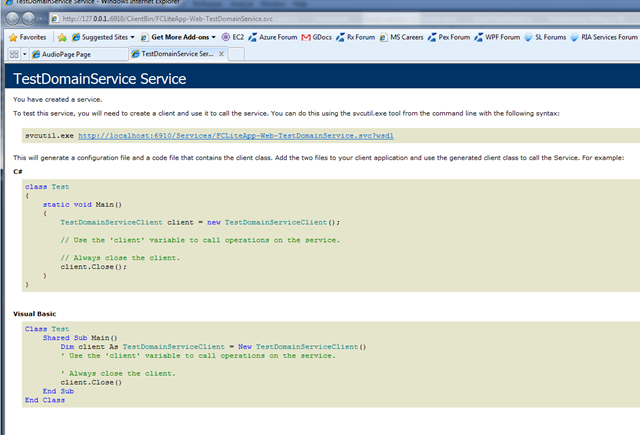 This will just cause the RIA Services load calls to return ‘Not Found’ errors back to the Silverlight page. In this case, there will of course be no trace in fiddler.